Today on the podcast we have a special guest! 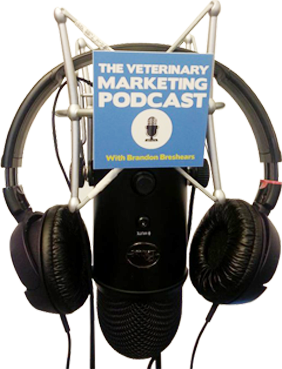 Dr. Mark Olcott founder of Vitus Vet is here to talk about using text notifications, push notifications, and postcards in your veterinary marketing. Vitus Vet app allows pet owners and their veterinarians to be able to access their pets full medical records, charts, and history, lab work, digital images, and medical notes. Vitus vet also allows you to be able to choose which forms of communication of reminders you would like to use from text notifications, push notifications through the Vitus vet app, email reminders, or postcard reminders. Multimedia marketing in your veterinary practice’s marketing is very important. Having options and your practice’s brand over a few different forms of media is super helpful to effectively reach all of your most valuable customers. Text notifications are great to use in businesses as they generally tend to produce some of the highest rates but on the downside, they can be difficult to get up and running. Vitus Vet offers a simple and easy way to text clients by turning your practice’s landline phone number into a textable number that allows you to have a two way messaging and picture sharing option to communicate with your clients. Offering multiple ways to send reminders and follow ups will help improve your client retention. Also remember to keep your ways of contact easy to use, if it’s not easy to be in contact with your practice you will lose potential clients. Make contacting your practice as easy as possible. if you’d like to request a demo of Vitus vet for your practice you can visit their site here. Be sure to listen and let me know if you have any questions, comments or need help with anything!